It’s time for a food fight! Olé! We are off to Spain to celebrate the world’s largest food fight with tomatoes. La Tomatina is celebrated on the last Wednesday of August in the town of Buñol near Valencia, Spain. More than 100 metric tons of over-ripe tomatoes will be enjoyed by all! Don’t wear anything that you can’t live without, as by the end of the 1 hour food fight your clothes will be forever lost to the battle. Perhaps La Tomatina was started as a local food fight among friends, a juvenile class war, a volley of tomatoes from bystanders at a carnival parade, a practical joke on a bad musician, and the anarchic aftermath of an accidental lorry spillage. Another theory is angry townspeople attacked city councilmen with tomatoes during a town celebration. The holiday was banned for a short time during Francisco Franco’s reign because it had no religious significance but after his demise in the 1970’s the tomato fight was back on. And although the numbers have ranged up to 50,000 people (in a town of normally only 9,000) the town now is limiting the number of tomato fighters to only 20,000 and this year will be charging an entrance fee to help boost their depleted coffers. The festival is in honor of the town’s patron saints, Luis Bertran and the Mare de Deu dels Desemparats (Mother of God of the Defenseless), a title of the Virgin Mary. So there you have it – the world’s largest food fight in only a way the Spaniards could celebrate. Tomatoes are a staple in every kitchen but hardly ever will you hear anyone extolling their cosmetic benefits. Whether you want to cure large pores or reduce acne and rashes or sooth a nasty sunburn or simply to revive the glow on dull skin, tomatoes are beneficial in beauty treatments. 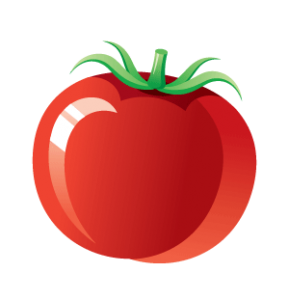 Tomatoes contain Lycopene, a potent antioxidant found in red fruits and vegetables. Its anti-inflammatory properties help clear excess oil from your hair and scalp, leaving hair feeling soft, full, and balanced. We decided to put our tomatoes to better use and made some fabulous new Saucy Chica skincare items! So to go along with our tomato holiday, we are offering a limited edition skincare kit. These fabulous products are only available in our special skincare kit, and kits are only available for the month of August – and only a limited number are available. They are $150 per kit. Purchase your kit in August and receive a free voucher for a Lip AND Eye Treatment on your next facial! ($30 value). 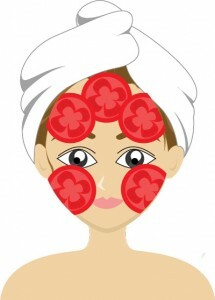 We will also be offering a Tomato Facial this month using our fab products and a mask that we will make in-house based on what you need! We use honey in some of our facials currently and of course that’s local and usually from Carolina Honey Bee! (just a little FYI). A simple way to get that gorgeous glow radiating from your clean skin! This daily cleanser maintains your skin’s pH balance while removing impurities, purifying and refreshing your beautiful complexion. Go ahead, spend a little extra time in the mirror checking yourself out – you’re balanced, beautiful, and beaming! 8 oz. See our website for the full ingredients list for each item in the skincare kit. Live Strong has good things to say about tomatoes for the skin as well. Have a rash of some kind? Try a mixture of honey and tomato juice. Leave on the skin for 15 minutes and then remove with lukewarm water. A great recipe to relieve sunburn can be made by adding 2 tsp tomato juice in 4 tbsp of buttermilk. Apply it all over your skin. Wash it off after keeping it on for half an hour. Just a reminder be sure to test patch before you put something on your skin. Generally if you can’t eat something you should not use it on the skin either! Here’s another great site for DIY Masks – check it out. 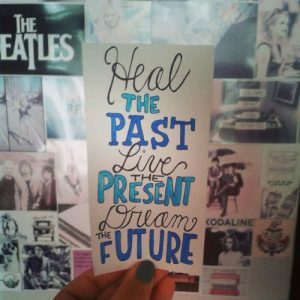 We are excited to announce our Healing the Past, Living the Present and Dreaming the Future series of Healing and Growth with Greenville Yoga. We teamed up together last year to bring you a month of healing through forgiveness. We hope you will join us when you can for our events. These events are open to everyone and we encourage you and would love for you to share these events with your friends and family. This year we will be raising money and awareness for Safe Harbor. Safe Harbor is a nonprofit organization that provides safe shelter, counseling and advocacy for victims of domestic violence as well as leadership for education and prevention efforts throughout its four-county area of Anderson, Greenville, Oconee and Pickens, South Carolina. We will also have drop boxes at Raspberry Moon and both Greenville Yoga locations to drop off items on their Wish List. South Carolina has the highest rates of domestic violence resulting in death in the country! In 2011 there were 1,707 females murdered by men in a single victim/single offender incident. 94% of the female victims knew their offender. 61% of those women killed were wives or intimate partners of their killers. Thurs, October 2, 7:30-8:30 pm – Write On: from dream to page, write your path forward with Heather Marshall @ ARY. She facilitated a fabulous writing class for us last year. Can’t wait for this year. Check out my post about last year’s class. Saturday, Oct 11, 7:30-10ish – BellyDance Performance and Hafla (Party) with Discordia Arts and Friends @ ARY. We will also be having a Silent Auction this evening. So come prepared to support a great event and raise money for Safe Harbor. Cash and Check appreciated, Credit Cards if we must! ;) Remember every little bit helps. We will update this post as new events are added or confirmed. Keep your eyes posted for all the info. If you would like to help us out by hanging posters, sharing on Facebook or your blog, donating or anything in between please let me know. We’ll take all the help we can get! Did you know that we now have an online booking system? Check it out at www.RaspberryMoonST.com (click the Book Your Appointment button on the right). We are slowly but surely moving everything over to this new system. The new system will enable us to send appointment confirmations, reminders, and allow you to change your appointment. Oct 17-Oct 20 – I will be in Ithaca, NY hanging out with my best friend Stephanie and my crazy nephews. Other than that, work is on like usual!